Writing is probably the most under developed skill that students have. Almost all of the students who come to me for tutoring have low level writing skills. Why this is so I'm not sure. Is it because teachers undervalue writing as compared to maths and reading? Or is it because teachers themselves are not proficient writers? To get students into the writing mindset they need to write everyday. Even the non confident writers need to do this. It doesn't matter what they write about or if there are many spelling or grammar mistakes, they need to feel comfortable with putting their thoughts down onto paper. Once they are eager to write then we can focus on the mechanics. I have students of all ages who are reluctant to write anything. It is as if they have been criticised badly for their earlier attempts. One reluctant student told me he wanted to write about nothing but when I told him to write a procedure teaching me to do nothing, it tickled his fancy so much that he began to write. 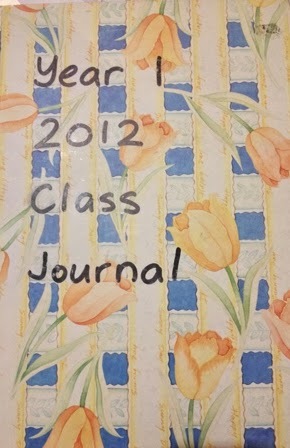 Another way I got students to write was to keep a class journal. When I was teaching Year 1, this was what I did. I encouraged students to write in it everyday by giving them incentives such as using lovely glitter or colourful gel pens or stickers/free time etc. At first, students wrote 1 sentence, then as the days progressed they began to write more. 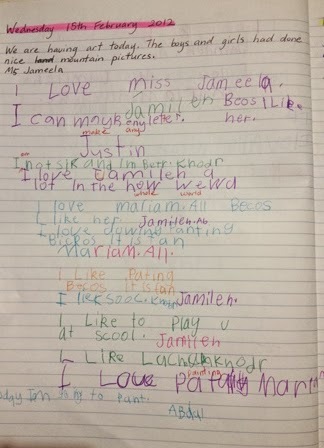 Class journals are good in that when students see others writing and they read what others are writing, it encourages them to write as well. It is also great for showing parents how students have progressed in their writing. 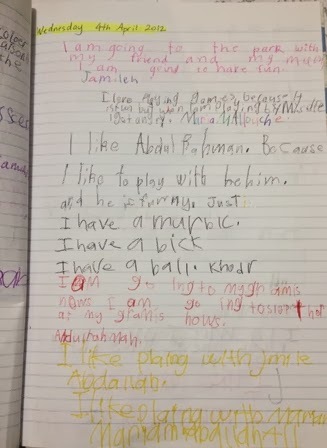 The pages below are from my Year 1 class journal. I only had this class for 1 term at the beginning of the year. It would have been great if I had stayed on for the whole year to see how they had progressed over the entire year. Anyway, what it showed was their progress from 1 short sentence in the beginning term of school until 2 months later where they wrote more or longer sentences. Students also like to write letters to their friends or family. I have boxes full of different types of envelopes and writing paper. When it was time for letter writing, students would choose 1 envelope and a writing paper. They then had to write to anyone they want, usually it was to their classmates. When they had finished, they would put it into the class mailbox and I would 'deliver' them at the end of the day. Most of the time, reluctant writers will get stuck on what to write about. Their usual response is, "I don't know what to write about." It becomes easier when I tell them what text type I want them to write. Recounts are easy: what they did in the holidays, last week, yesterday etc. They're always doing something, even if it's staying at home or if they're 'doing nothing'. I still get them to write about what they did when they do nothing. Procedures are easy too: teach me something or tell me to do something. Oh they love this. Reports are not too bad: write about something they like or interested in. Persuasions are ok: convince me of something. Is doing nothing better than doing work? Narrative writing is probably the hardest because they seem to have mental blocks for coming up with ideas. There are many ways to get ideas and one of them is to get students to write down 10 good characters, then 10 bad characters and then 10 problems. They then choose a good character, a bad character and a problem for their narrative. 1. Let them become confident writers first. This means no criticising. Let the words/letters flow. 2. Let them write about whatever they want. 3. Write everyday - even if it is in a journal or a letter. 4. If they don't know what to write about, give suggestions. Or brainstorm ideas. To read about the stages of writing, go here: Don't Forget to Teach Writing!